We've arrived and have set up our Table at Wizard World Philly. We had a good laugh at own expense, seeing as in the time it took us to set up our banner, most of the other artists and vendors set up their entire booths. Oh well, at least no one was hurt...much. Mark may not get the feeling back in his thumbs for a few days, but the banner looks real spiffy. We're taking a break for a while, but will be ready for when everyone gets in. Be sure to stop by Table 2309 and check us out. Don't forget your coupons and tell us that Dr. Entropy sent you! 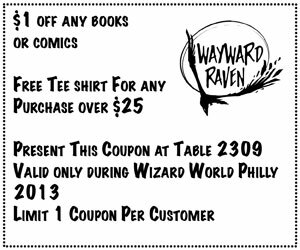 Wayward Raven will Appear at Wizard World Philly Starting Tomorrow! Just a reminder to come see us at Wizard World Philly tomorrow until Sunday. We'll be in Artist Alley, table 2309 all four days. We have a ton of cool stuff for purchase from comics to books to even a Damn Heroes activity book for the kiddos! Alex will be doing commissions and we have some great artwork for sale. Even more importantly, we have a ton of free goodies and discounts for folks who stop by to see us (for more info, click here). Don't forget to bring your coupon, can't wait to see you there!